Microblading is a time saver. 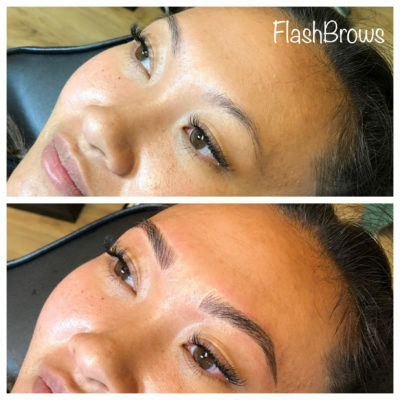 If your morning routine includes meticulously drawing on your eyebrows and filling them in with gels, pencils, and pomades, you can cut this step out with microblading. Wake up in the morning with perfect eyebrows with this semi-permanent makeup procedure. Your brows will be the perfect tint and shape every day, no makeup required. Microblading is also a money saver. The cost of makeup products can add up, as well as the cost of routine waxing appointments. Microblading only requires a one time cost, and even though it seems like an investment, the investment pays off. While you pay a notable amount of money for the procedure, the results last for years. Microblading adds convenience to your daily life. Not only can you wake up with perfect eyebrows every day, but you can also go swimming with microbladed eyebrows and have no worry about them fading or washing off underwater. You can also hit the gym, sweat, and leave the gym with the perfect eyebrows you had before you started your workout. Microbladed eyebrows aren’t going anywhere, so you can feel confident going about your day to day life. Microblading is a safe, comfortable procedure. With the numbing ointments applied to your skin before the procedure, you can barely feel the needle applying pigments to your brow area. Most clients say there is no pain at all, while others even fall asleep during their appointment! A licensed and professional esthetician can make this process as comfortable, safe, and effective as possible, giving you confidence and perfect brows! Want microbladed eyebrows? If so, schedule an appointment at Flash Brows by Heather Gordon! You can get the brows of your dreams by calling us at 972-804-4555, or visiting our website. We are located at Mattison Avenue Salon Suites at 7777 Warren Parkway in Frisco, and we hope to work with you soon!